Shawna Foster, left, pastor of the Two Rivers Unitarian Universalist church in Carbondale, listens as Yesenia Arreloa tells her story of facing deportation and family separation in a ceremony in May. Foster announced at the event that her church would provide sanctuary if needed. The congregation at Two Rivers Unitarian Universalist church in Carbondale is not waiting to see if a more aggressive deportation policy in the United States will affect members of the community. They are ready to act now. 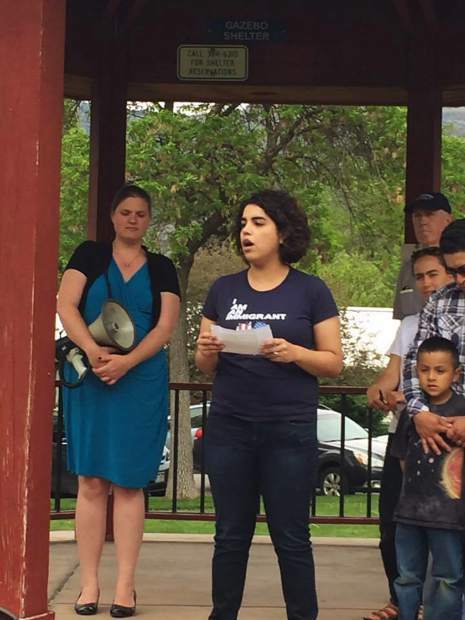 The congregation declared itself a sanctuary church during a Mother’s Day vigil in Carbondale to pray for families separated by deportation. “It has been well-received, with people who are trying to gain their citizenship relieved to know that there is a place to go to if things get desperate and their appeals are not heard,” said Shawna Foster, the pastor. The idea of using the church as a sanctuary arose when a Carbondale resident was required to go to a check-in with U.S. Immigration and Customs Enforcement. The woman had lived in the area for more than 20 years and had raised children who graduated from Roaring Fork High School. She was uncertain she would be granted a stay of removal. “She asked if she could take sanctuary with us, and though the space was not ready we decided that she needed to stay here,” Foster said. “Luckily, the week she was to take sanctuary she learned she was granted a stay of removal. “From that point on we decided that we should publicly declare ourselves a sanctuary congregation for anyone under the threat of deportation,” Foster continued. The process of sanctuary is lawful and transparent. The church informs ICE of the person’s name, their alien record number and the address of where they are located. Sanctuaries then typically call on community support for the person. Foster said the stakes in the immigration debate are great for Carbondale and the Roaring Fork Valley. “If every undocumented person was removed, it would tear our community apart,” she said.